In early Summer watch the finest athletes prepare and participate in TriAthy, Ireland's fastest triathlon. Such feats of endurance are nothing new to Athy, home of Ernest Shackleton, hero of Antarctic exploration. And from boxing champions at St Michael's Club to GAA, rugby and tennis, all tastes are catered for. It has been said that a man could grow an inch walking the fields around Athy, so good is the land. Athy hosted the very first Ploughing Champioships in 1931, and to see it return to its home was the highlight of 2009 and 2010. In 2009 and 2010, local girls Charmaine Kenny and Clare Kambamettu won the hearts of the nation at the Dome in Kerry when they were crowned the 51st and 52nd Roses of Tralee. Start your stay at one of the fine hotels, or a friendly B & B, either in town or choose a nearby country setting. Then the day is your own. Explore the heritage town, walk the river trails, browse the shops and get to know the many festivals and celebrations in this friendly community. If the "long walk after the small ball" is your thing, Athy Golf Club and the Cardenton Par Three are beautiful course in easy reach of the heart of Athy. Conveniently located near an abundance of attractions both locally and in bordering counties, Athy can be accessed easily by rail, bus, car and river. After a day sightseeing,hiking, fishing, cyclinghorseriding, even archery, enjoy a creamy pint, a bite to eat, a chat and the craic. Athy is off the beaten track,yet at the heart of everything, full of surprises, where you will be a visitor on your first night, and a regular by your second! 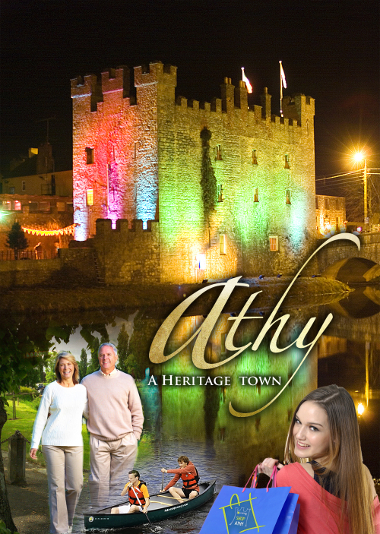 Athy Tourist Information office is located in the Heritage Centre in Emily Square. Opening hours are Monday to Friday 10am to 5pm and weekends on a seasonal basis. Tel 059 8633075 or see www.athyheritagecentre-museum.ie for further information.